Have you been eating more than normal, lately? Most people have. Holiday indulgences are in full swing...between rich party food, dinners and piles of seasonal comfort foods. Today I'd like to be brutally honest with you about the food abuse that is so rampant today, and I certainly hope that it doesn't offend you. Sure, I could write you a 'feel good' article about cutting back a few calories and exercising a few more minutes each day, but I'd rather write something that's truly helpful and will make a difference in your life. Here's the real deal: You abuse food. That's right. You're overweight because you eat too much, and you eat too much because it brings immediate pleasure. It's those extra calories that you eat to feed an emotional need rather than a nutritional need. It's excessively big portions that leave you stuffed. It's whatever you indulge in with mindless munching. Could you relate to any of the above? Most of us tend to gravitate toward a particular form of comfort food. For many women it's chocolate or other sugary treats. For men it often takes a saltier form. Think of the last time you ate for pleasure rather than nourishment. Why'd you do it? Out of Habit: Your body loves routine. If you always snack while watching television then you'd probably find it hard to relax without going through that munching motion. The good news is that once you break the cycle your body will quickly adapt to a healthier routine. To Change Your Mood: Does the thought of a cupcake bring a smile to your lips? How about a large pizza to lift your mood? Pay attention to the emotions that trigger you to overeat - you may be surprised how often you use food to feel better. Because Everyone's Doing It: Who can resist comfort food when it's offered among friends? Peer pressure doesn't just apply to teenagers - it's another reason to overeat. Remember that true friends will support your decision to refrain. Can you remember how you felt after you last filled up on comfort food? If you're honest, you'll admit that the stuffed and bloated feeling was downright awful. So why do it? It's your brain. Once you've made up your mind, for better or for worse, you can bet that your body will obey your decision to the letter. You've proven it time and time again. Making a change is hard - that's why I'm committed to being with you every step of the way. Call today to schedule a consultation. Breakfast is the most influential meal of the day. If you start your day with sugary pastries or a greasy breakfast sandwich, the rest of your food choices will follow suit. However, when you start your morning with a wholesome and nutritious meal you'll be more likely to continue with good choices throughout the day. 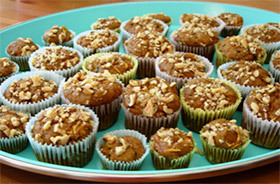 Try the Pumpkin & Zucchini Muffin recipe below as a nutritious start to your day. Don't let the rich flavor and mouthwatering moistness of these muffins fool you. You'll have a hard time convincing anyone, but this recipe was modified to include less fat and sugar than the original. This is a great treat to share at holiday parties.